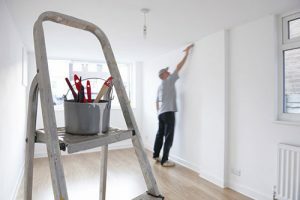 If all or part of your home needs decorating, the professionals at Absolute can always help you, no matter how large or small your budget may be. We can tailor our work according to your budget, because we can vary the level of services to meet your needs as well as your purse-strings. In an ideal world, we would always strip off any old wallpaper, line the walls and then paint them. With paintwork, we would apply two coats of undercoat, sand in between coats, and finish with a top coat. This combination provides the perfect finish which will last a long time. It also works well in the long-term, not only because it will last, but also because no extra work will be necessary whenever you want to change the colour. You’ll only need to repaint everything, as the surfaces will still be ideal. This is our Gold level of service. For those on a tight budget, including pensioners, we have our more basic Bronze level of service, which is very reasonably priced. Although it is not going to last 20 years, it does give everyone a chance to have a professional finish to their painting without having to revert to a do-it-yourself job or even worse, having to forego the chance to brighten up a room or the whole home. In between these two, we have our Silver level of service. This is not a basic service but it’s not the luxury one either, which is reflected in the price. For the Silver service, we remove the old wallpaper but we don’t line the walls, although they are sealed before we paint them. The woodwork will be sanded with one undercoat and one top coat. Whatever painting and decorating you would like done and whatever kind of budget you have, Absolute Decorating always has a solution. If you have any questions or you would like a quotation for some painting and decorating, give us a call on 07976 404742.